online, or at one of our locations. Delivered in 3-5 business days in an elegant black gift card holder with your personalized message. Delivered instantly or on a date of your choosing via email with your personalized message. Enter the 8-digit code from your Physical or Electronic Gift Card. You can redeem your Physical Gift Card or Electronic Gift Card through a Personal Stylist or on our website. To redeem online, enter the 8-digit gift card code on the back of your Physical Gift Card or from your Electronic Gift Card Email in the area designated “Gift Card” at the time of checkout. If you are new to J.Hilburn and would like to explore custom offerings, please use our Stylist Locator or call 866-789-5381. Physical Gift Card and Electronic Gift Cards are non-refundable and cannot be redeemed for cash. 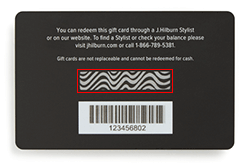 Physical Gift Card and Electronic Gift Card purchases do not count toward promotional incentives. Account credits cannot be used to purchase Physical Gift Cards or Electronic Gift Cards. Gift Cards cannot be replaced if lost or stolen. Gift card purchases do not count toward promotional incentives. Account credits cannot be used to purchase gift cards. Gift cards are not refundable.